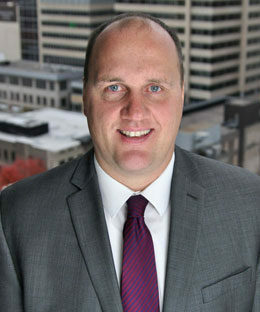 Eric Steinhoff is a shareholder with Lind, Jensen, Sullivan & Peterson, P.A.. Eric’s practice is devoted entirely to litigation, and he has represented clients in state and federal courts from around the region in all types of litigation. Eric represents business for claims brought against them for conduct of their employees, including negligent entrustment and supervision claims. He also focuses on representing doctors and lawyers in malpractice claims. Eric’s goal is to provide a clear path for quick and efficient resolution of his client’s problems with unique and creative ideas. Eric grew up on a farm in southwestern Minnesota. He believes his commonsense, blue-collar background allows him to effectively litigate cases by relating to juries and witnesses. He tries to bring a cost-efficient, practical approach to litigation by providing his clients with all the necessary analysis and information as soon as possible to allow his clients to make well informed business decisions.